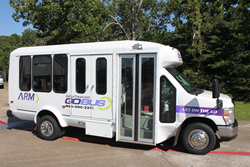 ETCOG's first remanufactured bus returns to service. Thanks to Vehicle Reman, two of our old buses with blown motors now look and drive like new. We saved over 50% and every bus came with a nationwide, powertrain warranty. Vehicle Reman is the pioneer of enterprise-level, remanufacturing Class 1 through Class 5 commercial vehicles that save customers up to 50% of replacement costs with equally impressive savings for the environment. Founded in 2005 to provide remanufacturing services to the U.S. Army, Vehicle Reman operates from a 60,000-square foot facility to provide body-off reman services for all powertrain, suspension, interior, and exterior work - in one place, at one time.